It is estimated that 20-30% of the northern and eastern parts of the Geraldton and Kwinana port zones are still affected by the dry season, despite recent rainfall events. In these zones, crops (cereals, lupin and canola) remain patchy and variable in height and will be a challenge to harvest. Thus, growers with short crops will need to adjust their machinery settings, or modify their header front, to effectively cut and convey a high proportion of heads (or pods) from the cutter bar into the header to reduce grain losses at harvest. Harvest losses can be significant and varies widely across good and below average seasons. In 2003, a survey of 41 paddocks within 50 kilometres (km) of Merredin, found that wheat harvest losses averaged 61 kilograms per hectare (kg/ha). These crops averaged 2.3 tonne per hectare (t/ha) with 90% of lost grain still in heads on the ground. Economically, assuming wheat was priced at $300/t, 61kg/ha equates to $18.30/ha or an overall loss of about $72 000 for a 4000ha cropping program. Assessments at Merredin in the drier 2002 season, found that harvest losses were exacerbated due to short crops. 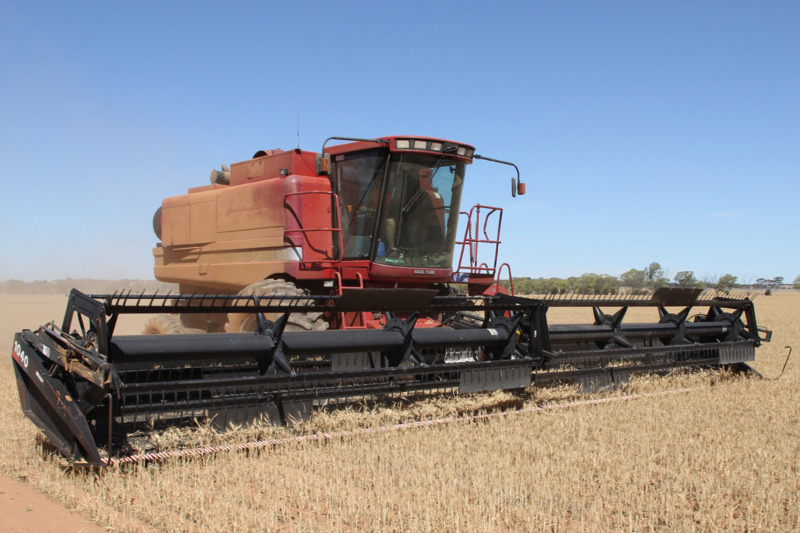 For wheat, the harvest loss was 70kg/ha (12%) in one paddock for a 0.6t/ha harvested crop. For lupins, the harvest loss was more than the harvested yield, with up to 390kg/ha of grain on the ground in one paddock after the machine harvested just 0.3t/ha. Grain can be lost: pre-harvest, due to natural shedding and environmental factors, at the header front, due to front type or set-up; and from the threshing system of the machine, due to incorrect settings for the drum or rotor speed, concave clearance, and wind settings. The source of grain losses, can be easily measured (see harvesting losses for more information). For short crops, significant harvest losses can occur at the header front, particularly in dry years, if heads or pods are mechanically dislodged from plants (by knives, cutterbar and reel) before entering the front. The reel helps feed the cut material into the front of the header and for short crops, one of the easiest modifications to a finger tine reel is to attach black plastic Corflute® to sweep the cut material back onto the table or belt. Corflute® is available from local stockists, such as sign writers or may be obtained online by searching for corflute suppliers. This material is relatively cheap and would cause minimum damage to the header if it comes off. Corflute® also allows for worn reel fingers as it can extend down evenly to the knife (Figure 1). Black Corflute® reduces reflection at night and is best with the ribs running down the finger for added strength. In past DPIRD trials, black 5mm thick Corflute® was fitted with 4.6 x 370mm black cable ties (mark with a white paint pen and punch 8mm holes for the cable ties) in a staggered pattern, see Figure 1. Sheets are generally 1220 x 2440mm, so cutting to 1220 x 271mm gives nine pieces which is enough for an 11m (36 foot) front. It is important to stagger the Corflute®, such as on each second section going around the reel, otherwise the driver's eyes tend to follow if they are in sequence, which could lead to driver headaches or fatigue. Knife sections need to be in good repair for short crops (taller crops can be rough cut and still feed in okay). Growers can check if the knife is sharp by feeling the edge with light finger pressure; it should feel prickly. If it is smooth then it should be changed. The knife section hold-down clips should also be adjusted with no more than 2mm of clearance so the knife cuts on the bottom of the knife guard (Figure 2a). The knife guard edge also needs to be sharp. It may need a touch with an angle grinder, or if it is too rounded, replaced. It is recommended you read your Operators Manual to ensure you make knife guard adjustments without damaging them. Also if the wear bar (which may be turned over) under the knife is worn, it will tend to make the knife section ride on the back edge, which will lift the important front cutting tip off the knife guard, as can be seen in Figure 2b. Additionally, it can also wear the back edge of the knife guard. Double density or quad knife guards reduce sideways movement of plants when cut and therefore shake the plant less than standard 76mm knife guards (Figure 3). Extension fingers that extend forward from the knife may also help catch cut material on conventional open front headers. Some manufacturers have various finger-gap spacings to suit different crops and various finger angles to suit the make and angle of fronts (Figure 4 and 5). If a lot of turning in-crop is done, extension fingers can push the crop over. Extension fingers are ideally suited to straight runs such as with controlled traffic or cases where only gentle in-crop turns are done. Keep plenty of spare fingers and knife guards on hand in case you hit rocks. An air reel can help blow short material clear of the knife back into the table auger or belt. This also helps with even feeding for maximum separation efficiency. Air reels used to be available for fronts up to 11m but may now only be available second-hand. The relatively inexpensive Vibra-mat®, from Primary Sales Australia, may also be useful on tin fronts for short crops (Figure 6). The table needs just a slight backwards angle and since the normal knife hold-down clips are replaced with a rear hold-down clip, the knife sections and guards need to be adjusted correctly first. The mat may also improve the evenness of feeding into the header which would improve the separation efficiency. Short cereal crops may also have small grain in the head tip, which is more difficult to thresh. Concaves and drum or rotor bars need to be in good condition to thresh properly under these low flow conditions. A problem for harvesting patchy crops is that the uneven feed of material can cause threshing to be poor and the wind on the cleaning sieves can throw grain out when the flow is low. One option might be to set the harvester for the low flow and accept a dirty sample from lack of wind in the better areas but then clean the seed with a high flow seed cleaner. It might be worth it, particularly for patchy canola that also might have to be desiccated with diquat to even up the ripening. The following tips came out of discussions with growers. They can be grouped under three headings: front, broad elevator and operating tips. On belt fronts, the bearings in the rollers under the belts should be changed before the season, particularly near the knife, as the chance of soil getting into partly worn bearings is increased when harvesting short crops. Crops like lupins may work down towards the knife in the centre which may jam the centre belt on belt fronts. A sheet metal filler plate just behind the knife with a rubber flap on top may help (the flap goes over the centre belt and the ribs on the centre belt flick the rubber flap which keeps the material moving). Harvestaire® sell a ‘Paddle Tine’ to replace 20% of the Hart Carter reel tines (type I and II) in a staggered pattern to help sweep material off the knife (Figure 7). In heavier crops they may carry material over the reel. A rusty surface can cause poor feeding over the platform and into the broad elevator of a tin front. Prevention is better than cure and applying rust preventative or painting the bare metal right after harvest is advised. Smoothing the rusty surface, especially where it leads into the feeder house and spraying with an ironing aid, such as ‘Fabulon’®, will reduce friction. Beware: Fabulon can make surfaces very slippery to stand on so only apply just before starting to harvest. You can adjust the front barrel of the broad elevator closer to the table auger by adding links and adjusting the broad elevator chain. Some headers have height adjustment, so it can be adjusted downwards as well. Take care not to move the barrel so close that it touches the retractable fingers or paddles. On belt fronts the front barrel may also be lowered but make sure the retractable fingers have 50mm clearance to the centre belt. The position of the retractable fingers may need adjustment to give this clearance. Check the serrated bars on the broad elevator (if fitted) for wear. They help to grip the straw. Rubber strips bolted onto every fourth or fifth bar of the plain type (non-serrated) broad elevator chain also helps to grip the straw. A rubber flap hanging over the top part of the opening into the feeder house will prevent material repeating inside the broad elevator being thrown out of the front. Replacement broad elevator slats called ‘Hi-Tooth Slats’ from Harvestaire may improve feeding on Case IH harvesters. There is more chance of picking up sticks, roots and stones, which cause damage if the header is not stopped quickly. The ‘stall stop’, or ‘stall test’ method may be the quickest way to stop the header, rather than using the clutch. This method may place stress on machinery and turbo charged engines in particular must be restarted immediately. Please seek your dealer’s advice on the finer details of the stall testing procedure to prevent equipment damage and personal injury. You may also need to throw out the separator. Pull the throttle back past idle to shut the engine down, flick the separator switch, or lever, move the throttle to idle and restart immediately. Slowing the rotor or drum speed will help keep bulk in the threshing area to improve separation in low flow conditions. Concave filler plates will also help threshing. One grower used old draper belting on the tine reel. Another said to put a bit of white paint on the draper belt so you can see it moving as low flow can make it hard to tell if the belt is moving - it could be jammed. Having a sharp knife also reduces stress on the knife drive wobble box. Have a shovel handy for cleaning sand off the front. Paddle tines were used successfully in the centre section of a front where build up was a problem. One very experienced grower suggested raised knife kits on belt fronts are a problem for harvesting close to the ground. The underneath section tends to bulldoze more than with the knife in the normal position since the rounded section is now further from the knife guards (Figure 8). He also said an air reel was the best as it doesn’t pull rocks in and is lower maintenance than a tine reel and keeping the belt angle at 37 degrees on Case IH fronts (the end skids parallel to the ground) helps keep the knife at the correct angle. Please be aware that any modification to the harvester, which is not approved by the manufacturer, may void the warranty and insurance. The risk is worn by the grower. For further information or any tips growers would like to share, please contact Development Officer, Glen Riethmuller, Merredin on +61 (0)8 9081 3111 or +61 (0)417 975 360. Thanks also go to Elmer Kidson formerly of the Merredin Research Station for fitting the material onto our header reel.